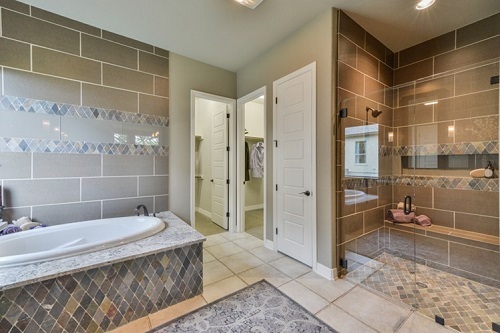 This bathroom setup is the epitome of style and grace when it comes to variety in color and material choices. The tile inlay in the shower and floor gives the room a sleek finish, while maintaining a sense of versatility when it comes to personal décor. The dark faucets and shower enclosure provide pops of color within the room, creating a captivating contrast with the inviting, warm gray color found throughout the rest of the area. The shower and tub are both extremely spacious and give off a sense of regal luxury while upholding their modern, chic look.